I’m no expert when it comes to detective novels but when I read a good one I’m really happy about it and I just have to tell you guys about it. The Case of the Missing Servant ignited some kind of desire to read more detective novels, especially of its kind. What kind you may ask? Those that contain larger than life characters placed in the modern-day back drop of hustling and bustling India. All the elements for a captivating intrigue are present; starting with Vish Puri. He is the managing director of Most Private Investigators Ltd. He’s a tall big Punjabi man who’s passionate about his work and takes it very seriously. He’s striking, intelligent, and loves his food. Looking at the cover one would have a tendency to compare him to a Hercule Poirot type character but that’s farther from the truth. He’s an original of his own kind – a hands on detective that uses the oldest methods around to solve crimes, mainly disguise. His talented team uses disguises and their knowledge of where they need to go to get the information they’re seeking. The highlights of this novel are all the information surrounding India, its regions, different dialects, food, violence, culture, etc. One major warning is this book will make you hungry for Indian food and I’m in Italy at the moment. Those are all the things I loved about The Case of the Missing Servant. When Vish was eating I was too in my mind. 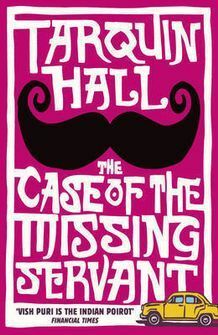 The Case of the Missing Servant will teach you about India and entertain you with a mystery. As I was reading along I had no problem picturing the scenes or the characters. Some of the characters aren’t described physically at all but for some reason I quickly imagined what they might look like with no problem. I could see this book being adapted to television or to the cinema with no problem, i.e. fantastic scenery, characters, plot, and costumes. This series will bring to mind The No°1 Ladies Detective Agency by Alexander McCall Smith, which I haven’t read yet. Although, I think the only similarities are that these series are written by Brits who have set their stories in a foreign country where they’ve lived and that they know well. This is what makes The Case of the Missing Servant so real. It’s clear Hall knows Delhi very well because of the quality of the descriptions and cultural references. Nothing is forced and everything feels authentic and flows. The writing style and the extra India facts are like icing on the cake. The only thing that bugged me was having to flip to the back of the book to the glossary to check the meaning of the different phrases and vocabulary in Hindu (sometimes 3 times on the same page). I would have preferred having the glossary footnoted at the bottom of the pages. I would have finished reading it much quicker, and footnotes would have aided in improving my reading flow. Overall, I love reading fiction set in India, especially when the details seem to be realistic and the plot is engaging. Tarquin Hall was born in London but has lived abroad most of his life in various countries, including India, Pakistan, Turkey, the United States, and Kenya. He is a successful journalist and has written over seven books and many articles which have appeared in top British newspapers. His first book was published in 1994. From there he continued to write other novels like, To the Elephant Graveyard (2000), which has been deemed a classic and Salaam Brick Lane (2005), which is a non-fiction book written about his return to live and rediscover life in London and in particular Brick Lane with his Indian-born American fiancée. I’m really interested in checking this one out since I need to read more non-fiction. I’m also curious to compare it withBrick Lane by Monica Ali. I would like to see how accurate the setting and feel of Brick Lane was in comparison to Hall’s real account. Subsequently, Hall then ventured into writing detective novels by creating the dedicated, clever, and proud Punjabi detective Vish Puri, beginning with The Case of the Missing Servant(2008), The Case of the Man who Died Laughing (2010), and The Case of the Deadly Butter Chicken(2012). The fourth novel, The Case of the Love Commandos will be out this year at the beginning of October. Look forward to more reviews on this series. I can’t wait until The Case of the Man who Died Laughingshows up in my mailbox. So, if you’re looking for a detective novel with a special twist check it out.